Viva Cuba ! ! ! 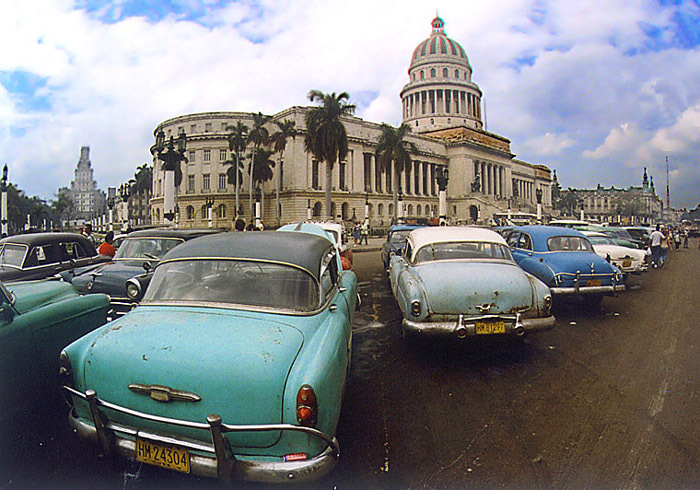 The fabulous Havana Capitolio, one block south of Parque Central, dominates Havana's skyline. It was built between 1926 and 1929 as Cuba's Chamber of Representatives and Senate and was obsequiously designed after Washington's own Congress building, reflecting the United States' expanding influence in the early 1900s. The lofty cupola rises 61.75 meters and is topped by a replica of 16th-century Florentine sculptor Giambologna's famous bronze Mercury in the Palazzo de Bargello. The pristine recently restored building is constructed of local Capellania limestone. The row of antique cars parked in front is always a common sight and adds a unique sense of deja vue to the scene. Inside the Capitolio (right) is the Great Hall of the Lost Steps and facing the door is a massive bronze statue of Cuba's Indian maiden resembling Liberty and representing the Cuban Republic. 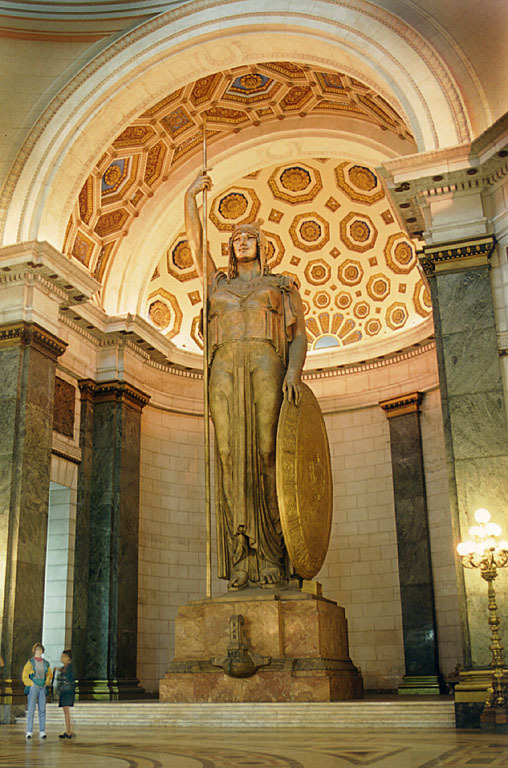 She is the world's third-largest indoor statue. In the center of the floor is a 24-carat diamond that marks Km "0" -- the starting point from Havana for the country's highways. The diamond, alas, is a replica (rumor has it that the original is kept securely in Fidel's office). Above the Great Hall is the dome and the gilt covered barrel-vaulted ceiling. You can get a sense of the scale of the statue by noting the two people at the bottom left of the photo. Truly magnificient.